Spa Resort Casino needed a sign that would showcase their new casino entrance and stun visitors while advertising their many activities and promotions. The experts at Best Signs, Inc. recommended a Watchfire display to contour to their existing architecture and present a programmable, vibrant and unique solution. This creative use of LED signage earned Best Signs, Inc. of Palm Springs, Cal., the Grand Prize in the 2016 Watchfire LED Sign Awards. Watchfire Signs established the awards program in 2014 to recognize Watchfire dealer partners who best showcase the capabilities of outdoor digital advertising. The second annual awards recognize on premise signs designed and installed in 2015 that display excellence in design, legibility of digital messages and advertising effectiveness. 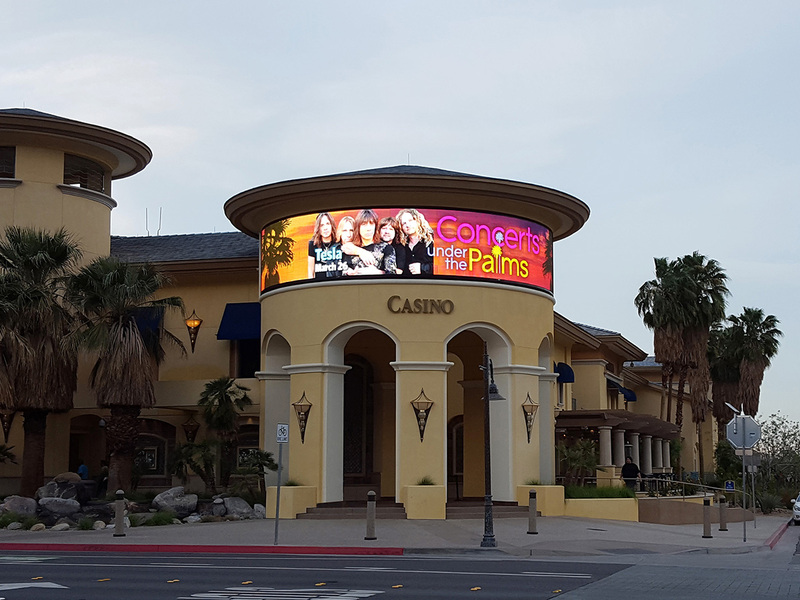 The Spa Resort Casino sign uses a Watchfire 10mm, full color message center in a curved digital installation measuring 7 feet tall, with 54 feet of LED display wrapped around the casino’s main, circular entrance. Watchfire’s beveled edges, standard on every module, deliver a seamless viewing experience, even on curved applications.